How small business owners are growing and maintaining work-life balance. Amy Friedrich, Amy’s a senior vice president at Principal with a passion for helping small to mid-sized businesses. It’s been said that the instant a small business owner becomes successful and decides to step back from the day-to-day grind, their success starts to slide. But recent insights have shown small business owners can prosper, expand and enjoy some time for themselves. We’ve surveyed small business owners* for the past five years. During that time, we’ve seen a jump in economic optimism, hiring and growth. The number of business owners who are optimistic about their economic outlook for the coming year has increased, and more than a third plan to increase wages and add staff. All this is happening while the number of working hours for business owners continues to drop. In fact, these days, small business owners are working an average of 43.9 hours per week. That’s down from 44.7 in 2015 and 45.7 in 2014. And 67% of millennial business owners are working 40 hours — or less — per week. It’s not magic. It’s all about strategy and planning. And looking at things from a new perspective. These are the top three ways small business owners are striking the right balance between work, family, home and hobbies — living Life with a capital L.
1. Build a strong team. It sounds like an obvious solution, but some business owners find it difficult to hand over the reins. If you fall into that category, consider giving it a try. Because the truth is, having the right team on board can help your business thrive — and help you feel more comfortable stepping away. That’s where recruiting the best plays a crucial role. Make sure you’ve outlined the positions you need to fill, and take an active role in the hiring process to ensure you like and trust the people you hire. It’s a two-way street. When you build your team to its highest potential, your business grows. And when your business grows, you can hire more staff. In the 12 months leading up to our survey, 92% of small business owners either maintained or increased their staff. 2. Use the most effective tools. Want to be more mobile and make your business more efficient? Putting technology solutions into action is a smart way to do business — and live your life. Technology can help you and your staff get the work done faster and easier, communicate better, and work from anywhere at any time. Log on remotely to keep tabs on your business and meet with your teams. And tools aren’t necessarily techy. Try “no meeting Fridays.” While it’s nice to get together with your employees, there’s something to be said for keeping time open to get projects to the finish line, or at least the next step. Days set aside for no meetings can be a valuable tool, whether you’re working on-site or remotely. 3. Know how to weather a storm. We’ve seen small business owner optimism continue to grow since 2013. What’s behind it? Business owners clearly learned some tough lessons from previous market downturns — 69% have surplus capital on hand. Of those with a surplus, 35% are saving for future growth, and 19% say the economic crisis taught them to save for a rainy day. They’re ready for anything, and positioned to grow. Your role as a small business owner is vital — to your community and to the people you employ. Small business owners employ 48%** of American workers. They also produce 16 times more patents per employee than large patenting firms***. That’s why it’s vitally important to work smarter — not harder — and set solutions into motion that help you maintain work-life balance. The innovation and passion that comes from small business owners can’t be rivaled. It’s contagious. When small business owners are feeling good, they have the power to move the entire economy in the right direction. 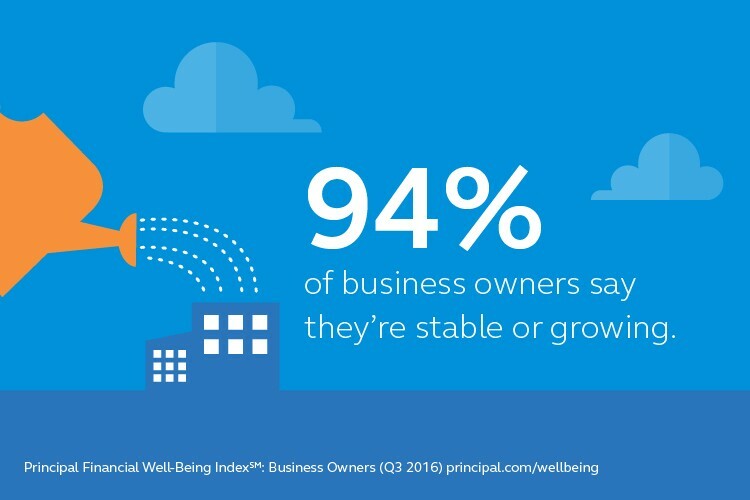 The Principal Financial Well-Being Index: Business Owners surveyed 604 business owners nationwide that employ 10 to 500 American workers. This group owns at least 5 percent of a company that they’re actively involved in managing. The Index is part of a series of quarterly studies commissioned by The Principal Knowledge Center examining the financial well-being of American workers and business owners. The survey was conducted online by Harris Poll® from June 29 — July 29, 2016. *“Things are sunny on Main Street;” Principal Financial Well-Being Index: Business Owners; September 15, 2016; https://www.principal.com/about-us/news-room/news-releases/things-are-sunny-main-street; viewed 12/1/16. **“Statistics of U.S. Businesses Employment and Payroll Summary;” U.S. Department of Commerce — Economics and Statistics Administration — U.S. Census Bureau; released February 2015; https://www.census.gov/content/dam/Census/library/publications/2015/econ/g12-susb.pdf; viewed 12/1/16. ***“Frequently Asked Questions — Advocacy: the voice of small business in government;” SBA Office of Advocacy; September 2012; https://www.sba.gov/sites/default/files/FAQ_Sept_2012.pdf; viewed 12/1/16; most recent available.